There is no doubt about it, truck beds have been getting smaller. Many trucks are becoming less about hauling capacity and more about being a family vehicle. The increase in cab length has led manufacturers to shorten many truck beds. Closing your tailgate after loading your ATV is becoming nearly impossible with many trucks. This is especially a concern if you need to secure other gear in the bed, like fuel packs, ramps and gear bags. Professional freestyle motocross rider Lance Coury felt the same concerns when he started hauling dirtbikes in his truck. That’s when he developed the Moto-Gate. The design is really quite simple. It’s based on a net made of nylon webbing stretched between two tie-down straps. The Moto-Gate Original measures 17 inches by 54 inches. It is secured by straps on each side that adjust from 10 inches to 39 inches long allowing you to reach most any tie point in your truck bed. 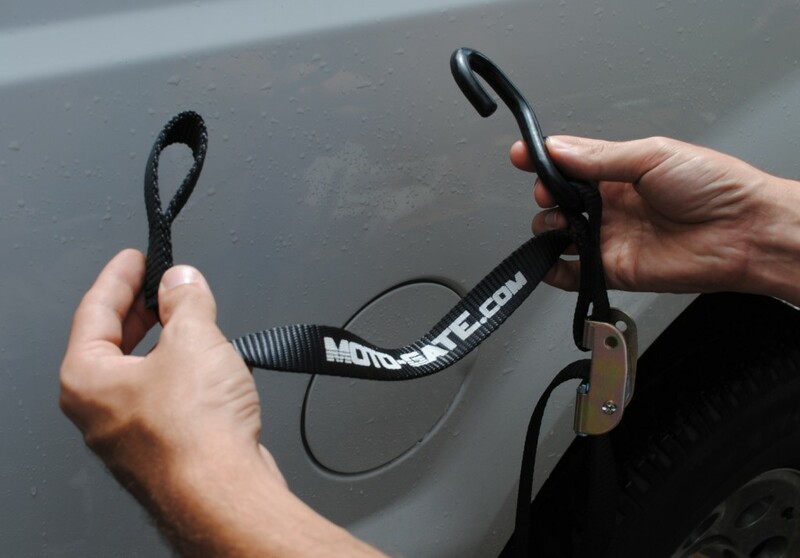 For smaller trucks the Moto-Gate Mini measures 12 inches by 36 inches with the same 10 to 39 inches of strap adjustment. The end of the straps have rubber coated hooks and the straps are adjusted by weather resistant, spring-loaded cam locks. The Moto-Gate takes less than a minute to install. The Moto-Gate takes all the worry out of losing your gear on a haul. In particular, we found it to be a great way to keep ramps in place rather than trying to awkwardly tie them down. It also removes any fear of losing fuel cans or other gear. If you aren’t sold on the Moto-Gate yet, consider that the possible uses expand well beyond hauling your ATV, side by side or dirtbike. 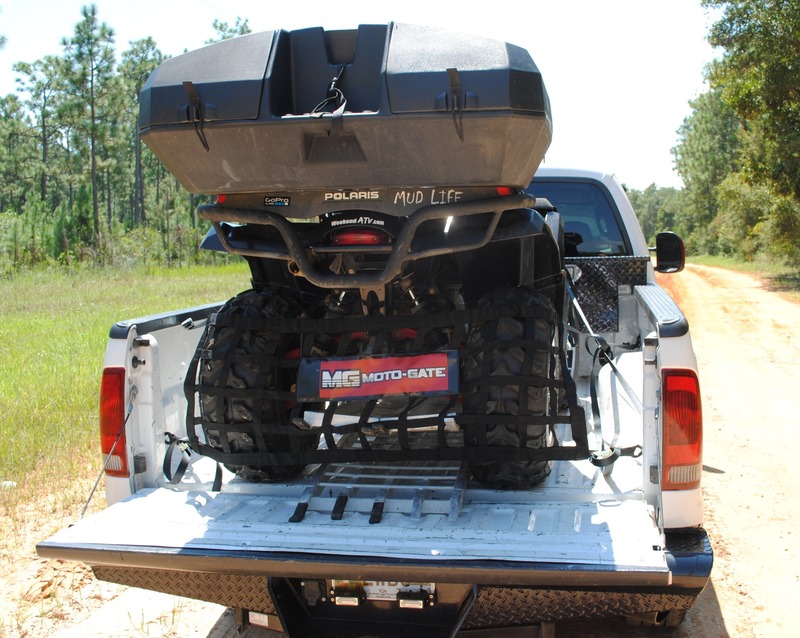 Stretched between the four corners of your truck bed, the Moto-Gate can help keep loads from blowing out. The Mini even makes a good tie down system for the bed of a side-by-side. Moto-Gate Tie Downs. Moto-Gate Stock Photo. While testing out the Moto-Gate we also had a chance to try out the Moto-Gate Tie-Down straps. The six foot straps are great, especially if you are hooking up alone because one end has a carabiner instead of a traditional hook. The other end is specially designed with the offroader in mind giving you the choice of a nylon loop or a hook. The tie-downs feature the same spring loaded cam locks found on the Moto-Gate. The Moto-Gate is one of those items you look at and say “why didn’t I think of that?”. To that we say thank you to Lance for creating this must-have accessory. The Moto-Gate Original and Mini carry an MSRP of $59.95 each. The Moto-Gate Tie-Downs can be had for $29.95 a pair. Both products have found a permanent place on our toolbox. 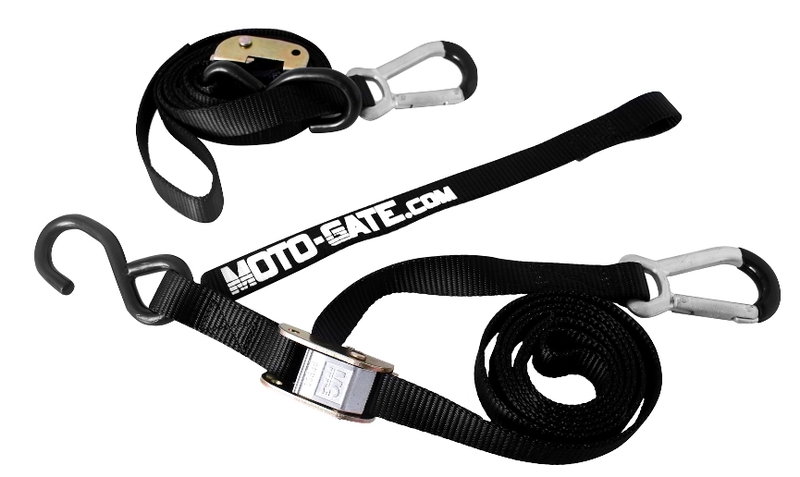 For more details about Moto-Gate products or to make a purchase, check them out at http://www.moto-gate.com. KTM fans can find a KTM branded version of the Moto-Gate through their product line. 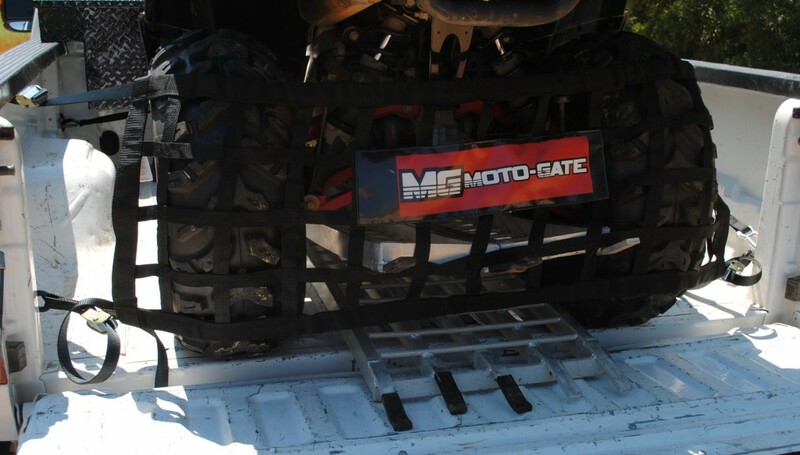 This entry was posted in Accessory Review, Getting There and tagged accessory, moto-gate, motogate, storage, tailgate, tie-down, tiedown by charlie. Bookmark the permalink.